Co-workers: All I have to say is, if I disappear, you’ll know where to find me. I’ve already briefed you on the perks of co-working spaces, those communal business offices for solopreneurs and freelancers — even small business teams that aren’t ready to sign long-term leases. 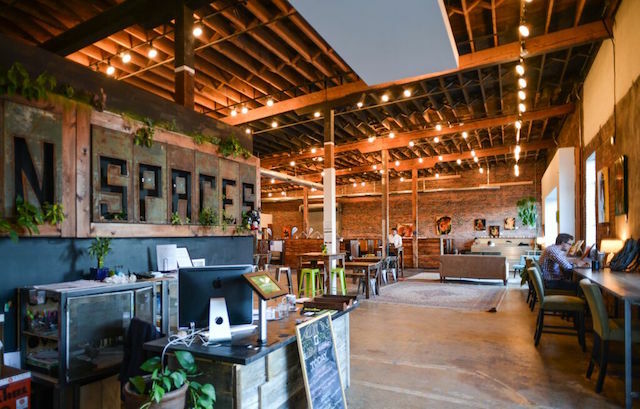 So in order to inspire your work-from-home and co-working dreams, I found eight of the coolest co-working spaces in the U.S.
Ready for some eye candy? 8 Dream Co-Working Spaces Across the U.S.
From rock-climbing walls and solar power to “backyards,” these co-working spaces will pump up your creative juices and connect you with other powerful professionals. Welcome to Impact Hub on West Monroe Street. Well, one of them. There are Impact Hubs in 49 countries, but I think this one is pretty sweet. The vibe of the venue is very “Austin” and will certainly transport you from that stuck-in-bed feeling. In fact, Vuka means “to wake up” in Zulu, one of South Africa’s official languages. There are long picnic-style tables, comfy armchairs and even rocking chairs. Plus a filling station — aka coffee! Need some fresh air? Step into the quarter-acre backyard shaded by an oak tree. Oh, and it’s pup-friendly. You can snag a designated one-person desk here for $475 a month or opt for the general membership for $250 a month. Impact Hub is opening two more co-working spaces in the Austin area soon, and I’m sure they’ll be just as wild as this one. There are so many seating choices at Oficio that I wouldn’t know what to do with myself. You can snag a window seat, flex at a standing desk, utilize a private workstation or plop into a plush armchair. Amenities include speedy Wi-Fi, mailing services, meeting rooms, phone booths, private bathrooms, storage lockers, copy/print/fax/scan gadgets, gourmet coffee AND espresso and member lunches. And don’t forget the networking events and happy hours. There’s also beautiful rotating artwork produced by the Boston arts community. Memberships here start at $69 a month. This company has two Boston locations — both on trendy Newbury Street. I know, confusing, right? To clarify, Brooklyn Boulders is a co-working space in Chicago (though there are New York spaces). But this one is huge — 25,000 square feet huge to be exact. But this isn’t just a co-working space with Wi-Fi. It’s also a gym for those who “work too much to go to the gym” (guilty). Different, right? Brooklyn Boulders also has locations in Boston. OK, I might be biased because I lived in Denver for a bit (and loved it), but Green Spaces in RiNo (River North Arts District) is so cool — and so Denver. The 12,000-square-foot workspace is completely solar-powered (and dog-friendly!). It has private offices, team spaces, communal desk areas — the works. There’s plenty of light, comfy seating and open space to breathe. The website has a nifty map that outlines all of your options. Prices for this gem start at $75. With a $245 monthly lounge pass, you get 24/7 access, four hours of conference room space and member benefits, like free coffee and tea. Welcome to paradise, friends. Would you take a look at this view? This is Büro’s Midtown location in the hot city of Miami, and spans three stories and 20,000 square feet. The space is filled with plenty of seating, balconies and floor-to-ceiling windows. You’ll also be amongst area restaurants, shops and fitness studios. You can reserve a station — a dedicated desk with storage — for $449 a month. And of course the coffee is free and the internet is fast. Other locations include South Beach, MiMo and Coconut Grove. This co-working franchise has three locations in the city, but I’m smitten with the West Village space. It’s unsuspecting and resembles a neighborhood bar. The inside holds cozy nooks and bright bar seating at the windows — not for people watching! You can snag a free day pass to check the place out. After that, it’s $30 for a full day. The non-committal pass is perfect for those who want to pop in and out and simply switch up their work routine. This might be outside your traditional notions of a co-working space. It might not feel as entrepreneurial as others — perhaps more creative. Shared occupies an unassuming building on Bryant Street and holds a “toolshed.” Nope, it’s not a sketchy, dilapidated shack. This toolshed has everything a creative or constructive might need, including a reciprocating saw, a welder and an anvil — whatever those things are. There are also sewing and painting areas, along with your traditional desks and couches. Plus, most importantly, a kitchen. The space is open daily from 6 a.m. to 2 a.m. Weekday access memberships start at $250 a month. Not bad for San Fran. This industrial chic space will make you feel at home — without being so homey you fall asleep (big issue for me). The space holds a kitchen, lounge areas, desks and conference rooms. It’s all decorated like an Anthropologie store, which is basically heaven for me. As a member, you’ll have access to conference rooms, networking events, the kitchen, private phone booths, printing amenities and discounts for local gyms, car services, etc. Also, Google gave the location a walking score of 99/100, which means it’s awesome. You’ll probably want to sign up for a “hot desk,” which means you’ll get all the benefits and full-time access for $250 a month. For $350, you’ll get a dedicated desk. Your Turn: Did you find your dream co-working space? Send us pics! Carson Kohler (@CarsonKohler) is a junior writer at The Penny Hoarder. After recently completing graduate school, she focuses on saving money — and surviving the move back in with her parents.